Go “back to the grave” with this new outtakes compilation from the Night Huntress series! Indulge your love of paranormal super couple Cat and Bones with this ultimate “director’s cut” collection of deleted scenes and alternate versions from the first four novels in the Night Huntress series, complete with author commentary on each selection. Includes: the original beginnings of Halfway To The Grave, One Foot In The Grave, At Grave’s End and Destined For An Early Grave; a chapter written in Bones’s point of view; alternate versions of sections of Halfway To The Grave, One Foot In The Grave, and Destined For An Early Grave; the “white wedding” scene between Cat and Bones that never made it into the final books, several deleted love scenes …. and much more! Order audio book from Downpour, Audible, iBooks, or your favorite audio retailer. To read a sample of what you can expect in Outtakes From The Grave, go here. – Goldilox and the Three Weres. The first four Night Huntress books were the first books I had ever written, and I never thought they’d be published because I hadn’t started trying to get published at that point. I wrote them for me, which meant that I took more time to explore the characters through alternate scenarios, multiple side plots, additional backstory, additional love scenes, and increased personal revelations. When it came time to shop the novels , I had to take out a lot of that material in order to condense the stories to meet average word count lengths. Later, even more content was taken out during the editorial process. However, I saved all that extra material. Over the years, I posted a scene or two to show readers some of what didn’t make it into the published novels, and I was surprised and delighted when readers requested more. Last year, I posted a large, alternate “middle” version of Destined For An Early Grave on my blog, and when I asked readers if they wanted to see more alternate versions, the answer was a resounding yes. That’s when I decided to compile the best of those deleted scenes and alternate versions into one single anthology, so readers could see the full version of Cat and Bones’s story. I also wanted to include commentary as to why a particular scene or version didn’t make it into the published books, so readers could get a further glimpse of what went on behind the scenes. 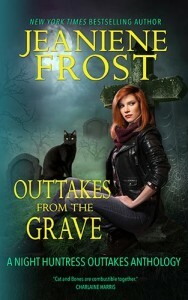 The result is Outtakes From The Grave, a Night Huntress series companion anthology. It contains all the deleted scenes I previously posted, plus lots of never-before-posted scenes and alternate versions. While it is not a new novel, it is novel sized. In fact, Outtakes From The Grave turned out to be longer in word count than any book I’d previously published. I very much enjoyed revisiting Cat, Bones, and the rest of the Night Huntress gang with this collection, and I hope that you enjoy it, too :).